The DPS SchoolChoice window opens Jan. 15, so now is the time to begin researching the best schools for your student. The DPS Great Schools Enrollment Guide is a great place to start! 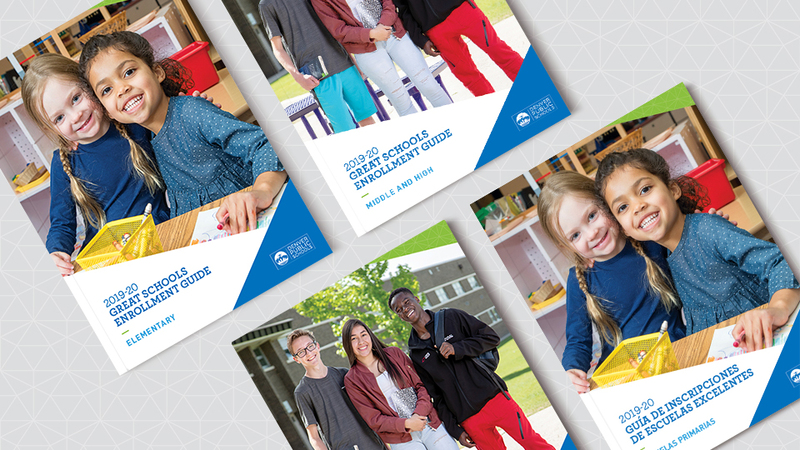 These guides are the go-to resource for information on all DPS schools, including details on programs, transportation, enrollment for the next school year and more. You can view both printable and interactive versions of the guides. The printed guides are available at all DPS schools, or by contacting the Office of Choice and Enrollment Services. SchoolChoice is as easy as Find, Apply, Register! FIND the best DPS school for your student by reading the Enrollment Guide, using the mobile-friendly School Finder, attending school expos and touring schools. APPLY between Jan. 15 and Feb. 15, 2019 at 4 p.m. by ranking your top schools using the online SchoolChoice application tool. You will be able to access the application at schoolchoice.dpsk12.org. REGISTER for your school after you get your school placement results in late March, 2019. Equity is at the heart of SchoolChoice. We believe all students should have access to quality schools, regardless of background or address. SchoolChoice is available for students who wish to apply to a different school for the following academic year. It is also for transitioning students who have completed the last grade at their current school and need to select a school for the next year. Families rank their students’ top school preferences in the SchoolChoice application. We then match students to schools based on those preferences, as well as school admission priorities and available space. Note: Incoming preschool and kindergarten students must participate in SchoolChoice on a yearly basis; due to space limitations, enrollment in a preschool program is not guaranteed. If your student is currently in kindergarten through 11th grade and will be staying at his or her current school for 2019-20, you do not have to fill out a SchoolChoice application. You can always get the latest information about SchoolChoice at schoolchoice.dpsk12.org. If you need additional help or have questions, start by contacting the SchoolChoice hotline at 720-423-3493 or visiting the front office at your child’s school.